Delpsi is partnering with Microwave Imaging System Technologies (MIST) Inc to develop a microwave tomographic imaging modality for the detection of breast cancer. The concept is based on the hardware conceived by Profs. Meaney and Paulsen of MIST over the past decade: 16 monopole antennas, alternatively used as transmitters and receivers, define a circular region of space around the breast. 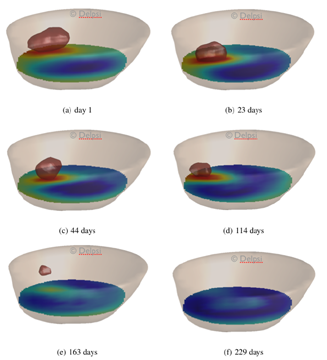 The signal picked up by each receiver for alternate transmitters is then used to invert the dielectric and conductive properties within the breast, revealing the presence of a tumor, if present and if detectable. Recently Delpsi developed a reconstruction algorithm able to produce full 3D images in roughly 20 minutes on a regular computer (as opposed to 15 hours on GPU enhanced computers). The technique is currently further evaluated and has shown similar levels of accuracy obtained in a fraction of the computational time. The figures below illustrate how the technology can be used for patient monitoring, providing feedback information at regular intervals (as closely spaced as desired without inducing health hazard), thus complementing MRI exams that typically occur at the beginning and the end of the treatment.